Nowadays we have Uber, Lyft, and taxies to help us get around but some people still stick with classic hitchhiking. People aren’t the only ones who hitchhike because animals have been seen to do the same thing too! 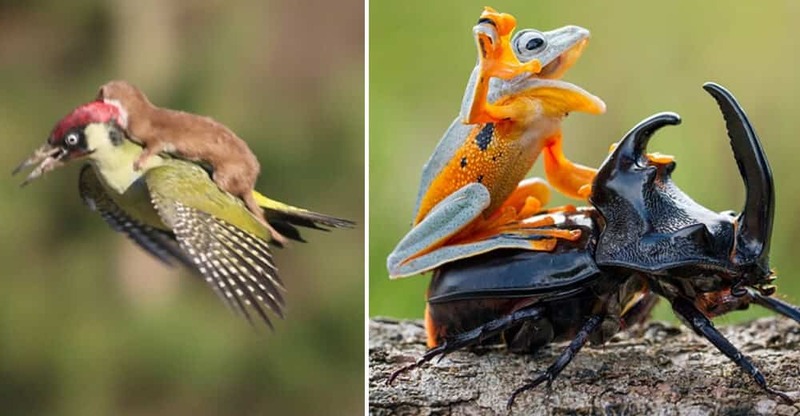 To make things even more hilarious, the most unexpected animals ride each other in order to avoid walking to their destination. With that said, be prepared to laugh because #18 and #12 are going to crack you up! 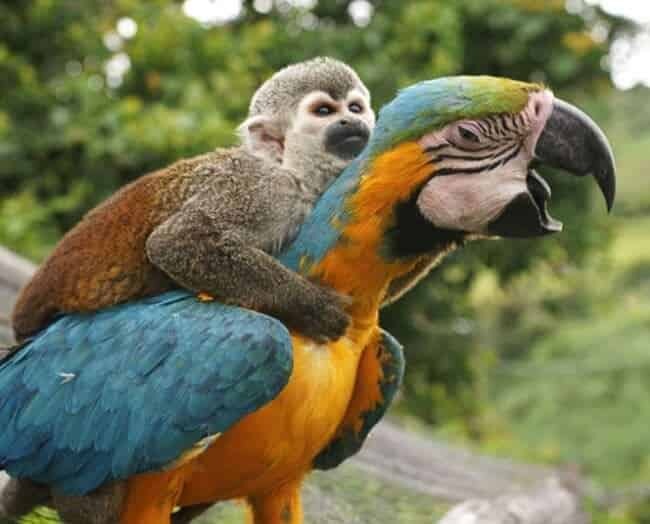 This parrot must be the perfect Uber driver. He won’t just get you to your destination, but he will also keep you entertained with colorful jokes along the way. If you think this picture is hilarious, then you are not ready for what’s coming next! 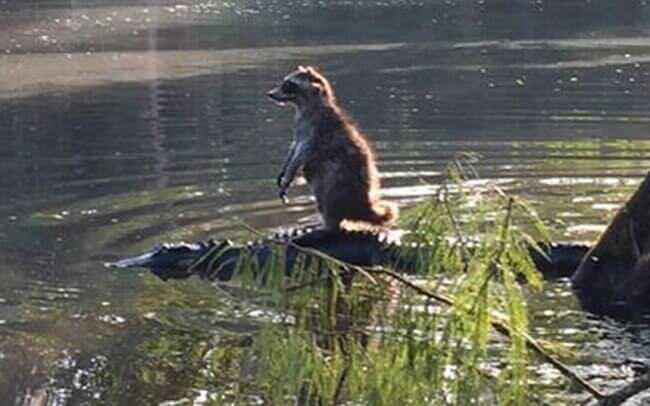 I think it’s safe to assume that you would never expect a raccoon to hop on an alligator. Although, how else is the raccoon supposed to cross the river? 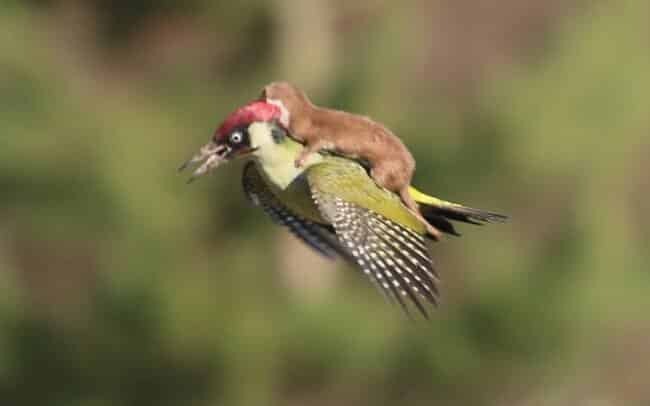 Judging from how tense the woodpecker looks in this picture, that baby weasel might be a little overweight. Let’s hope they landed safely! The next picture will bring a smile to your face. Now this German Shepherd is the definition of a good boy. 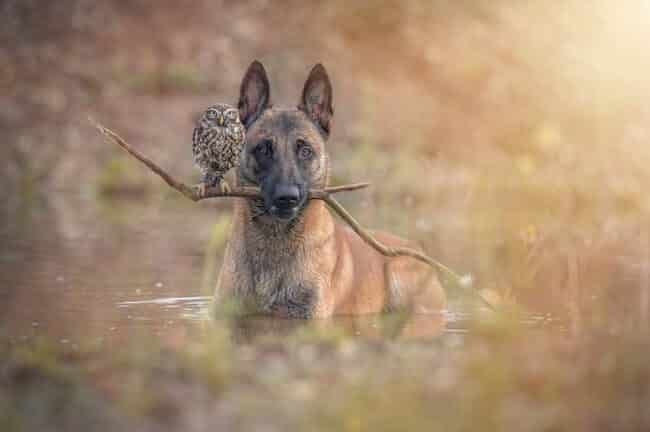 He doesn’t just carry the baby owl around, but he also brings a branch with him to make the owl comfortable. Isn’t he adorable? This picture might be one of the funniest things you will see today! I love how the monkeys are just waiting there for their ride to start. It’s like they are saying “come one already, I need to get to work fast!”. 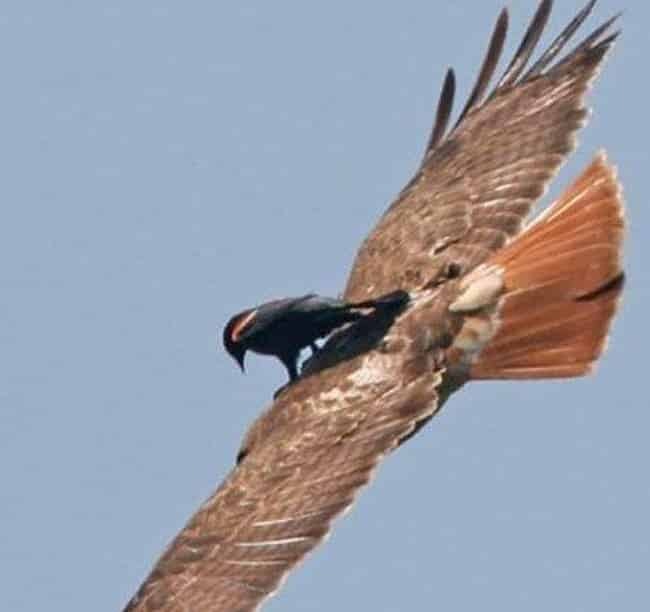 Is there a faster way to get around other than to hop on the back of an eagle? This little bird knows how to take shortcuts while being lazy at the same time. Isn’t this little puppy just too adorable? 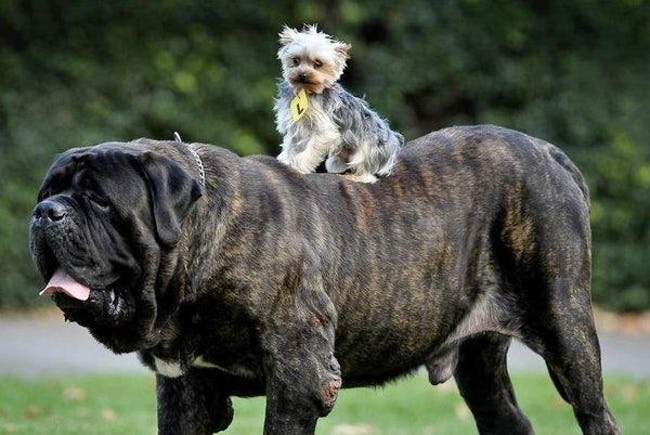 Luckily, he has the big mastiff to take care of him. 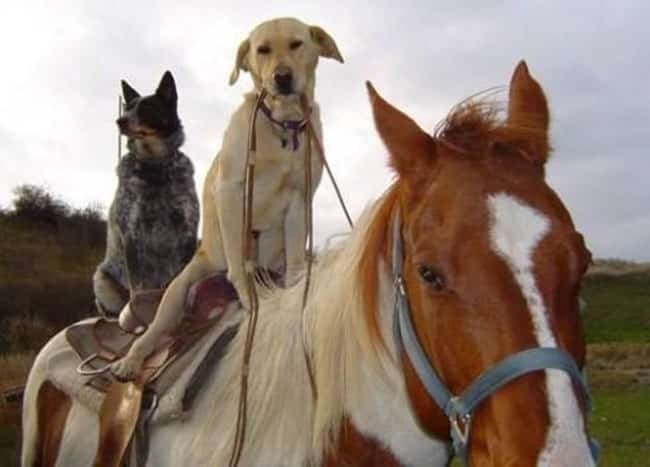 I bet that no one is ever going to mess with the little puppy while he is sitting on the back of his friend. 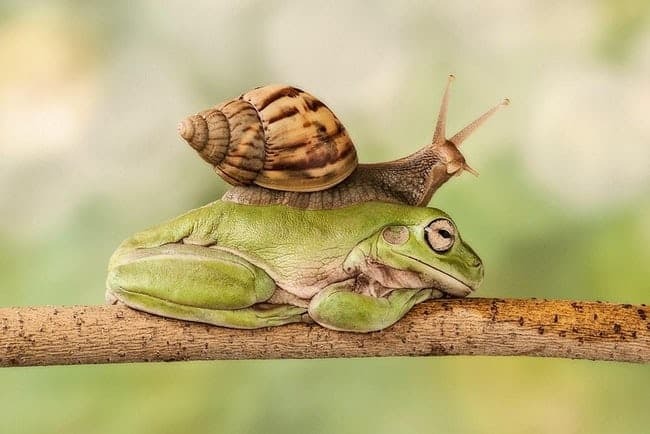 This snail better be prepared for a bumpy road because this green toad is going to hop all around the place once it wakes up. Talking about toads, make sure to keep reading because the next picture is way too hilarious to skip! 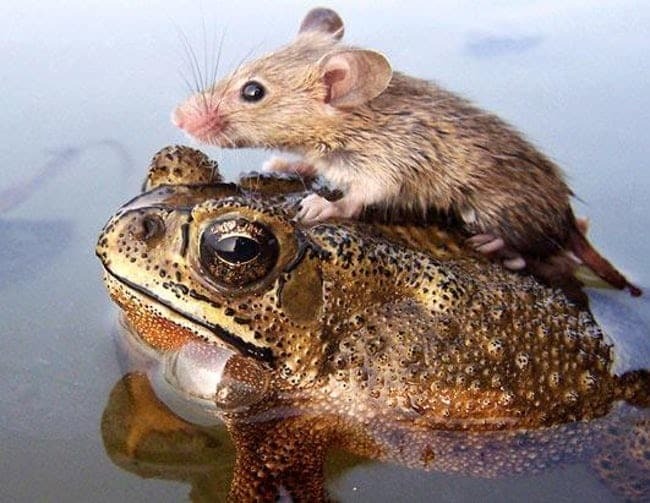 Who would’ve guessed that toads help mice get over the river? The way the little mouse is holding to the toad is just too hilarious! Hopping around is probably a fun ride for the mouse though. I guess no one told these two friends that dogs and cats are natural enemies. Not just that, but cats and mice are also not on good terms, which makes this picture so much funnier than it already is. Is this a live adaptation of Disney’s “The Lion King”? The little boar looks a lot like Pumba. The next photo is amazing! 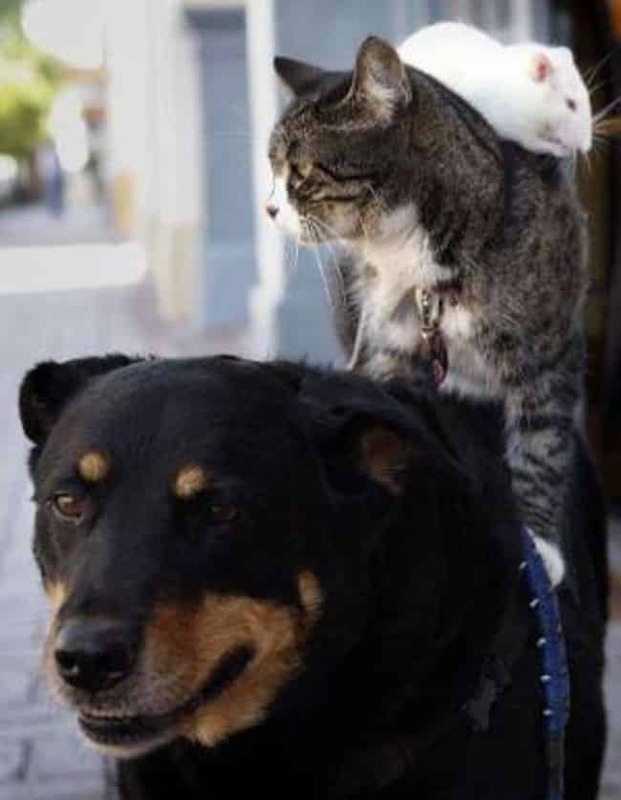 Even though this kitten might be too lazy to walk around and she decided to take a ride instead, her trip is going to take so much longer now. 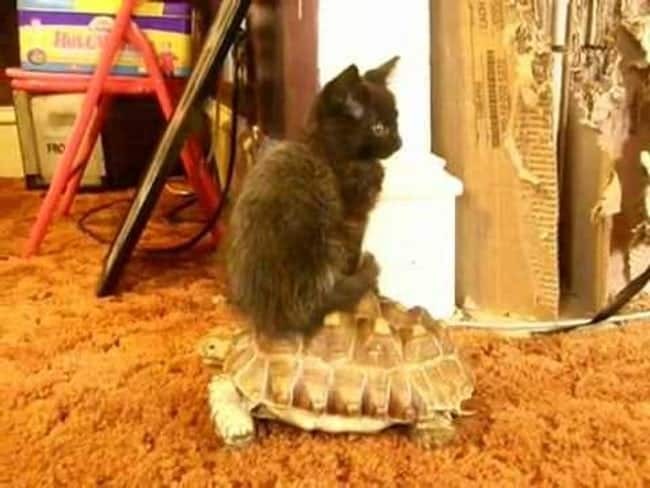 Turtles aren’t known for their speed, but at least their shell makes for a comfortable ride. Isn’t it funny how serious these two dogs look? The way the one in the back is looking at the sunset is just too hilarious. 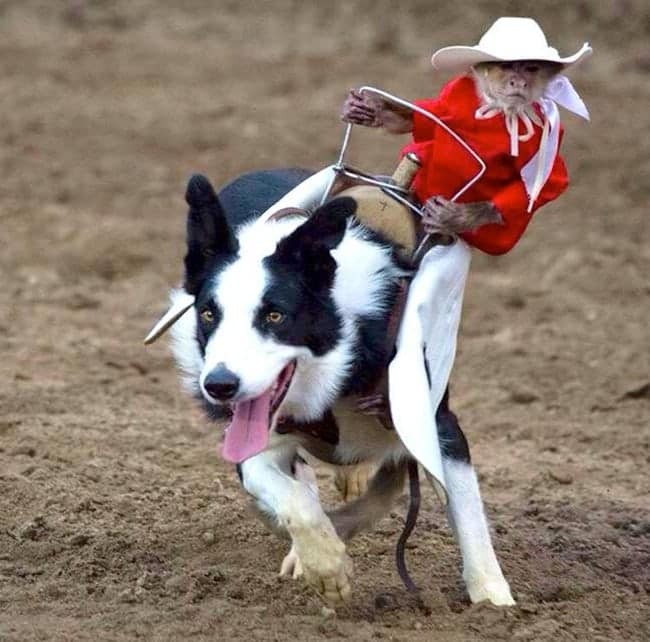 Monkeys are known for being smart, but I would’ve never expected one to put on a hat and become a cowboy! 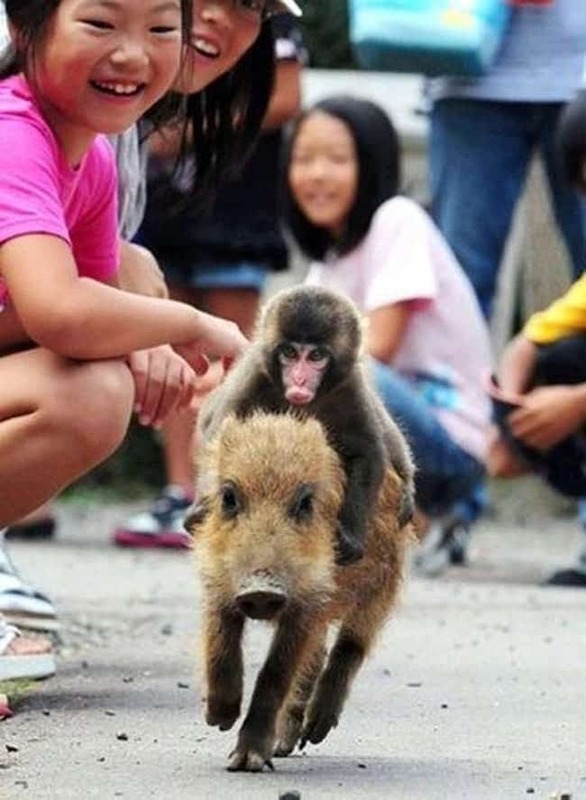 From the looks of it, this dog loves running around with the little monkey on his back. 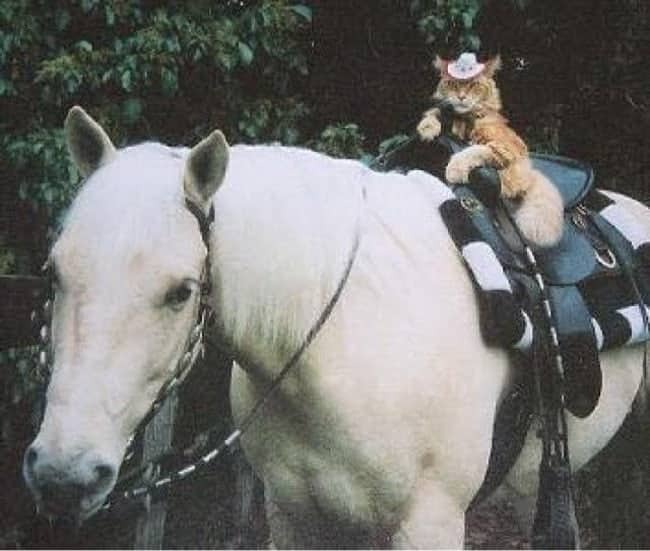 Now, this is what a real cowboy looks like, or should I say cow cat? That small hat is what makes this picture so amazing, but the cat’s serious face makes me laugh the most! 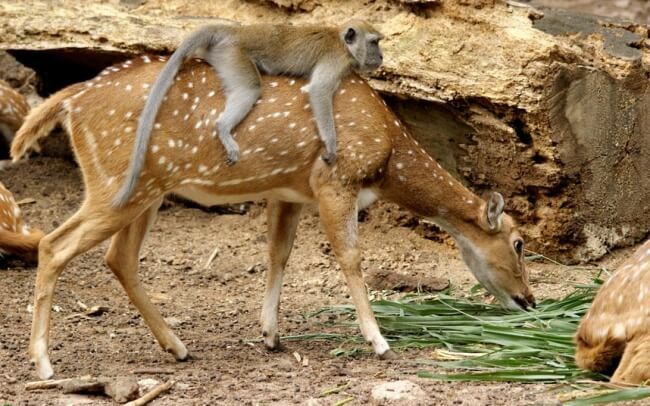 The little monkey didn’t make a wise choice when it hopped on the deer because the deer is never going to take him to his destination and it’s just going to eat grass instead. 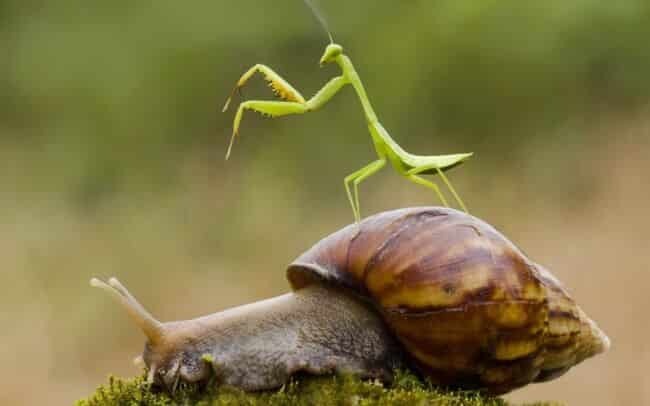 Even though this is the position that praying mantises always stay in, I can’t help myself from imagining that the bug is giving directions to the snail. The next picture is just too adorable to skip! 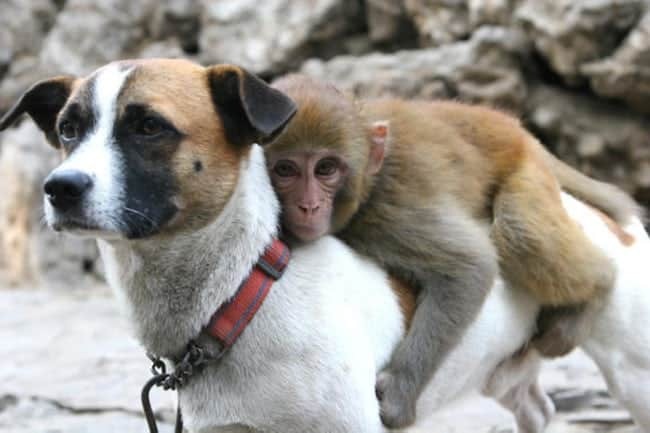 If all those years climbing trees have taught this monkey something, then it must be how to hold on tight because it is never going to fall off the dog’s back. Do you love goats? Then the next picture is for you! 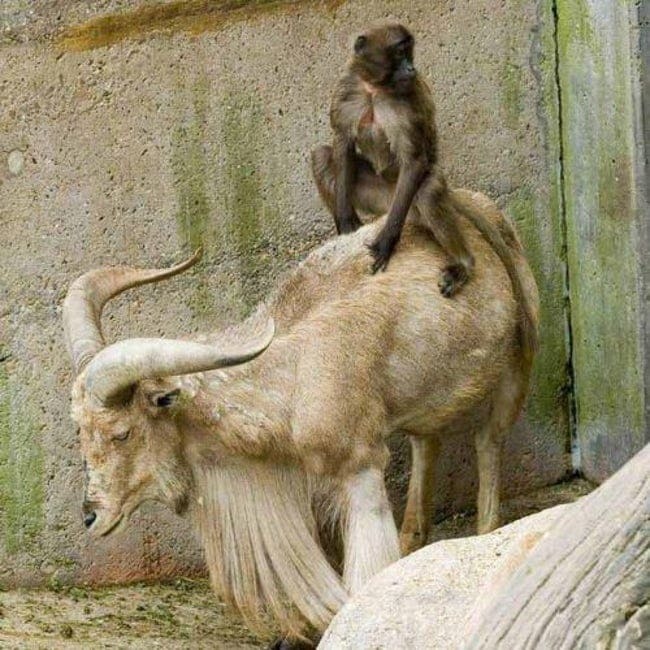 This goat is probably the version of an off-road SUV for the monkey because goats are known to climb mountains and defy gravity while doing it. These pictures showed us that lazy animals love nothing else than to be carried around by others. 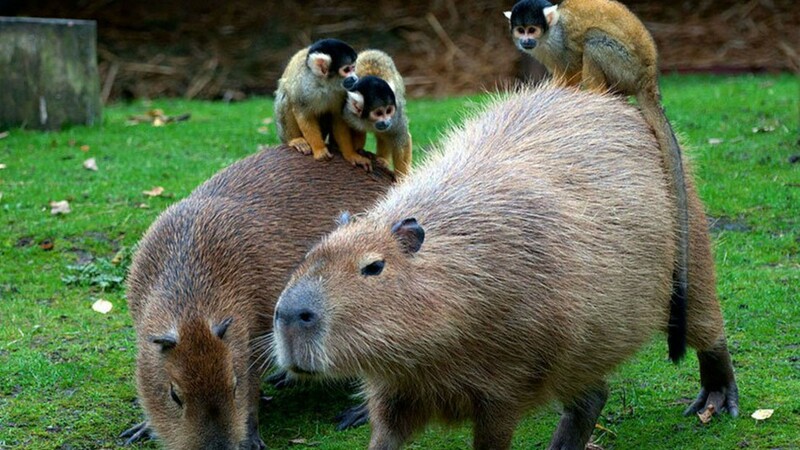 However, these unusual animal pairs sure brought a smile to our faces today!